Savour the taste of jalapeno without all the heat. Mix it with a recipe that needs just a little more zip. Pepper Jellies have become incredibly popular, especially with cheese trays! Galloping Cows always uses high quality fruit and vegetables. If they did not grow it, then they know the grower, and evaluate the fruit as it's washed and chopped. They strongly believe that only high quality fruit can give a great product with a good shelf life, and are always very careful to produce something which they themselves would want to eat. 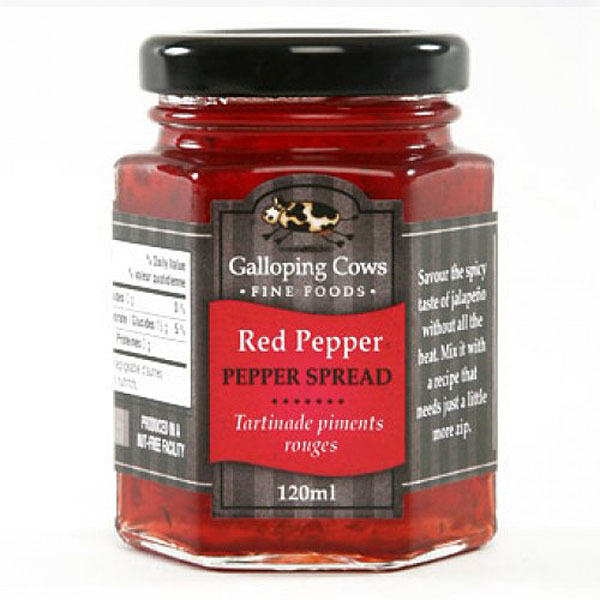 The red pepper spread has the same level of heat as the Galloping Cows Cranberry and Orange Pepper Spreads. All pepper jellies are wonderful when poured over cream cheese, brie or camembert. Choose some assorted crackers and breads, and you have a very easy appetizer. Use pepper spreads in any pepper jelly appetizer recipe, like the ones using phyllo pastry, or put a drop of pepper jelly on top of your favourite appetizer, sandwich or wrap for more punch and delicious flavour.